THURSDAY NIGHT “SMOKED SPECIALITY” ~ PULLED PORK SANDO! “PULLED PORK SANDWICH” – TONIGHT @ 5PM! UMM…yeah…that looks pretty, pretty, pretty, ridiculous and they aren’t gonna last long! It’s no coincidence that the best tasting hog we’ve tasted, was grown locally by Sinclair Family Farm here in Loomis! 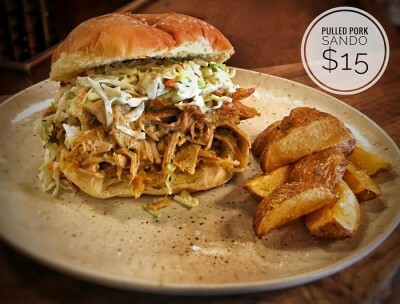 Starting at 5pm and while they last, we will be serving “Pulled Pork Sando’s” both in the bar and restaurant for $15. Pitmaster Spencer Smith smoked hog is delicious on its own but add some “shred sauce,” house-made slaw and dose of home fries…again, ridiculous!